So I installed LinuxMint 17 12 hours ago, and have been trying to install Japanese language input on this Japan bought Japanese laptop (I got rid of Windows) for this Office product (LibreOffice). I do have the keyboard set to Japan/Japanese (the keyboard also has Hiragana on it); I SEE "Japanese" in the screen at the bottom of the LibreOFfice when I change language input (from English).... BUT IT ALWAYS stays AS ABC ENGLISH. I installed iBus for Japanese (whatever that is), I installed Japanese in the settings, I installed JILT (whatever that is) but its just a confusing mess as far as LOGICAL human thinking goes. Are there any logically-minded human beings on the planet who can explain how to do it? (2) As for input, you would probably be better off asking at the Unix & LInux StackExchange, although there are previous questions about Japanese on this site as well. Hope that's a help while we await the experts. @David -Thanks for the link to the Unix&Linux site. I found an article to get my Linux input system running. 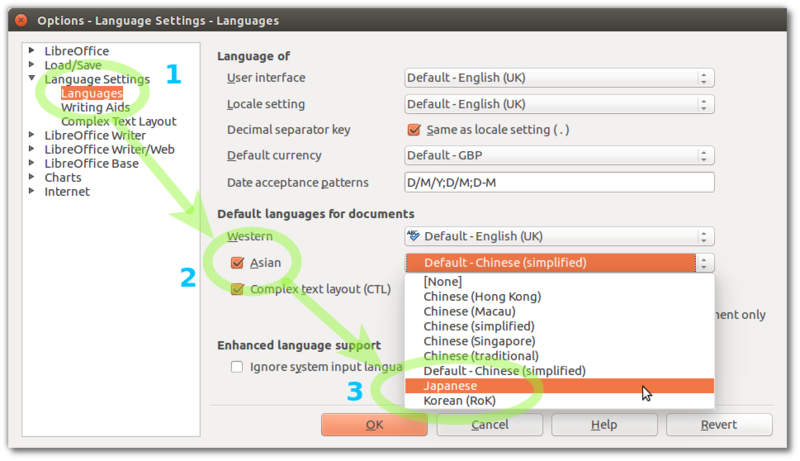 As for LibO you are right you also need to set Japanese the way you indicated. But that the VERY easy part.... I wish Linux would be as easy as LibO..... I am also open for any hint about getting SCIM running on LM Debian MATE. First, to write Japanese in LibO has nothing to do with LibO. You need to get the settings in your Linux Mint set-up. By the way, I am struggling in the same way with Linux Mint Debian and try to do with SCIM, which is an equivalent to IBUS. But if we are very lucky someone will give us the right answer.